This Integration can be applied to the following Products: Agency Life Quoter (ALQ), Mobile App, Website Quoter. 1. 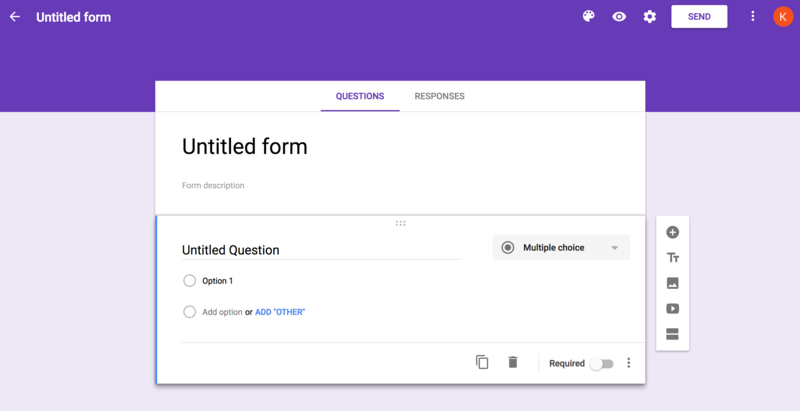 In order to use Google Forms use must have a gmail account. If you don't have a gmail account yet, create an account! 2. 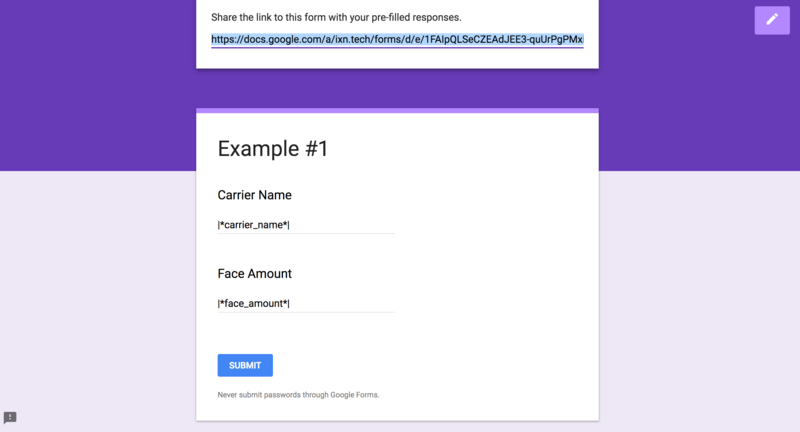 Once your gmail account has been set up and you are logged in, go to https://www.google.com/forms/about/ and click on "Go to Google Forms". 3. You should now see the page below. 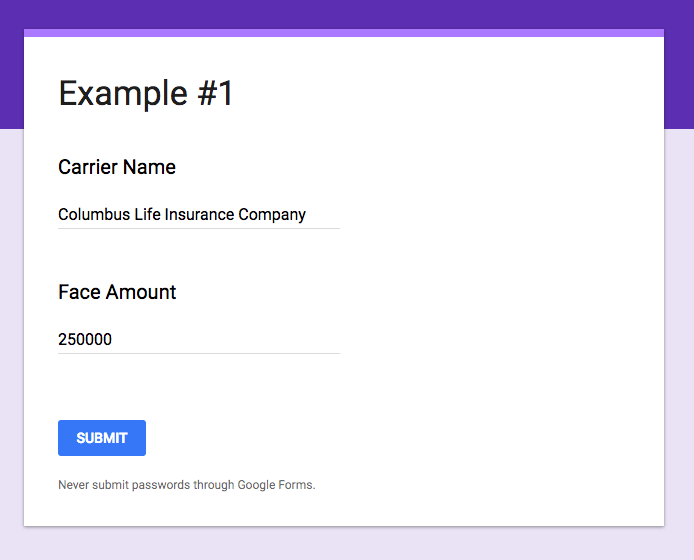 To create a new form, you can click on one of the templates listed under "Start a new form". For this tutorial, we are just going to use the blank template on the far left. 4. We are ready to work on our form! First, lets give this form a name. Click on "Untitled form" and type in your form name. It can be whatever you like, but we will name our form "Example #1". 5. Now that we have named our form, lets edit our first field. 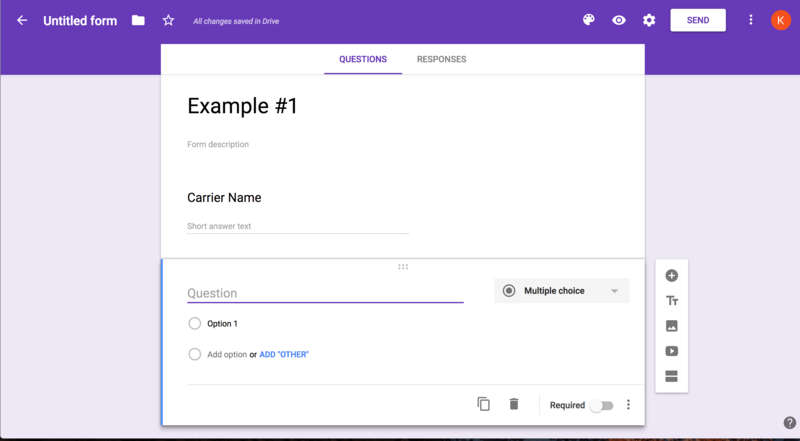 Click on "Untitled Question" and type "Carrier Name". Then click where it says "Multiple choice" on the right. A dropdown of options will appear. 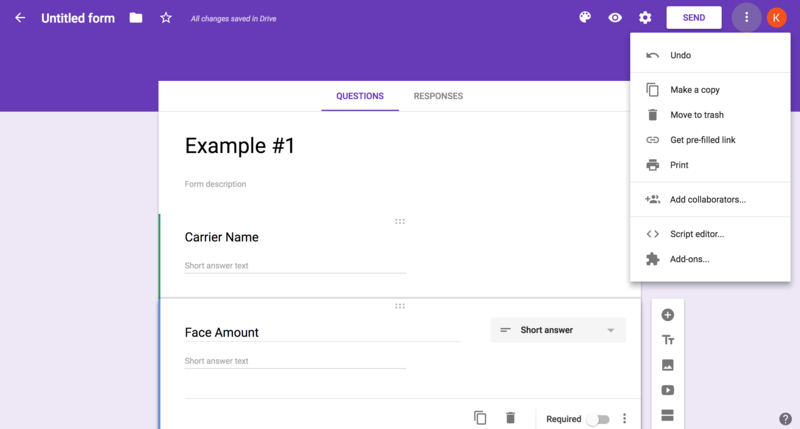 Select "Short answer". 6. You just finished your first field! Now let's add another. Click the addition symbol on the right to add another field. 7. To name your field, click the field that says "Question" and name it "Face Amount". 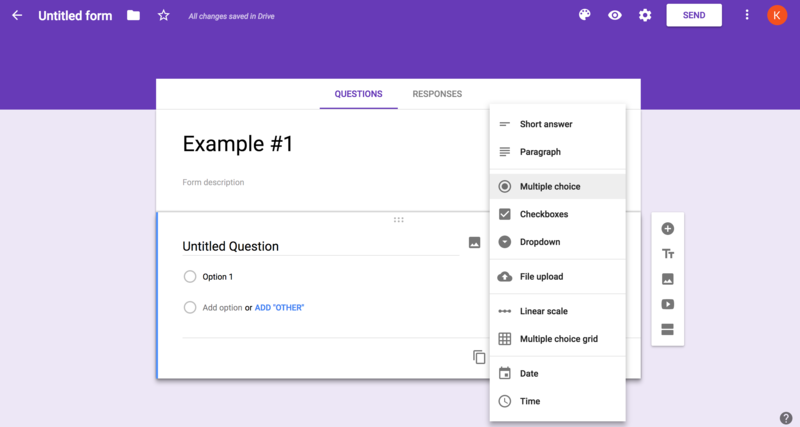 Then click where it says "Multiple choice" and select "Short answer". 8. 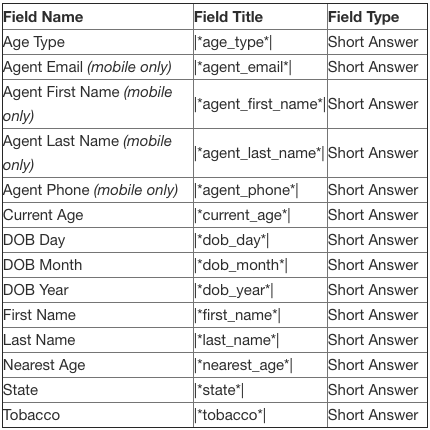 If you would like to add more fields, the chart below gives you a list of Field Names and Field Types to choose from (You can ignore the Field Title column for now, it is used later in this guide). Follow steps 5-7 to add your fields. 9. Now that we are done making our form, click on the menu bar with three vertical dots in the right hand corner. A list of options will appear. Click on "Get pre-filled link". If you've added more fields, make sure to enter the field titles for those fields as well. You can find the corresponding field titles in the chart from step 8. 11. Now click "Submit". Once you do, a URL will appear in the field at the top of the screen. Highlight and copy it. 13. Type in your email and password, and click "Login". 14. Once you are logged in, click "Products" in the navigation on the left-hand side. 15. Find your Agency Life Quoter, Mobile App, Website Quoter in your list of products. Click on the name. 16. Click "Settings" at the top of the page. 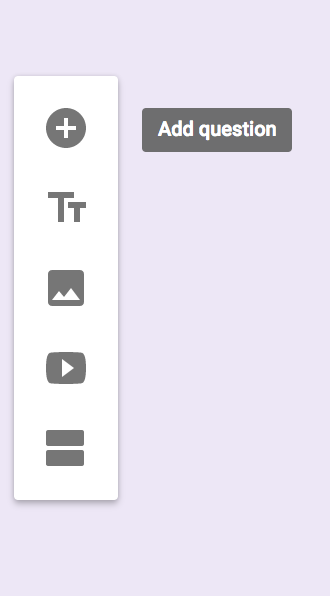 Select "Quote Actions" in the dropdown. 17. Click "Create New Action" in the upper right-hand corner. 18. Now we are going to edit type, label, and URL. First, click on the dropdown field below "Type". 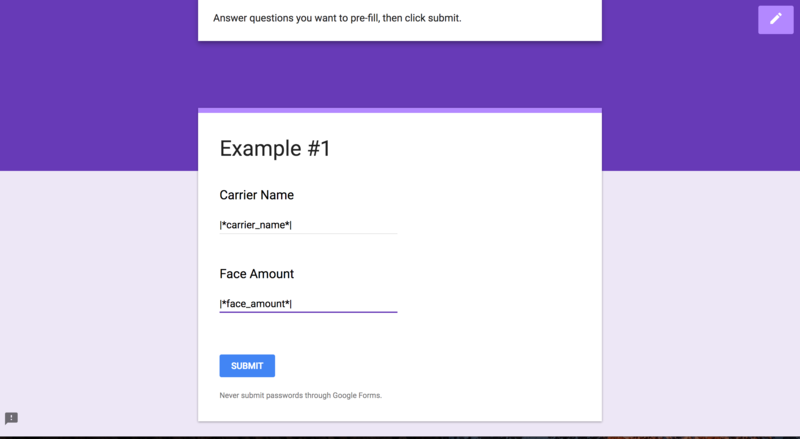 Select "Google Form". 19. Now, click the empty field beneath "Label". This is where we name our quote action. It can be whatever you like, but we will name our action "Google". 20. Now, click on the empty field beneath "URL". Paste the pre-filled URL from step 11. You can also upload an icon or limit carriers, but for this guide we will just click "Save". 21. Go to your product to run quotes! Enter the quote information and click "View Quotes". For this guide we will be using generic information to run quotes. 22. When you click on a quote, you will see a green menu bar. This will list any quote actions you have. We named our quote action "Google" so we will click on that. 23. A new page will open with the form we built. You will also notice the fields we created are pre-filled! This is because of what we did in step 11. If it didn't work, go back and make sure everything is as it should be. When you are ready, click "Submit" to submit your form! That is the end of our guide! Thank you for following along.